Earl Black, the Herbert S. Autrey Professor of Political Science at Rice University, will pay homage to a late Sam Houston State University political science professor as the first speaker in a series named in John Holcombe’s honor on Nov. 12. The annual Holcombe Speaker Series will kick off at 3 p.m. in College of Humanities and Social Sciences Building Room 070. An internationally renowned scholar on regional and campaign politics, Black will present “Reflections on the 2010 Elections,” a debriefing on the mid-term elections, and will also share his memories of Holcombe during the event. Black was Holcombe’s college roommate at the University of Texas in the early 1960s. “John combined intelligence, integrity, and friendliness as few do. We shared a common interest in American politics,” Black said of their college days. “We had long been out of touch, but a few years ago he invited me to give a talk at Sam Houston. It was a wonderful opportunity to spend some time together and catch up. “All the qualities I admired him for in the early 1960s were still very much in evidence,” Black said. Holcombe began his teaching career at SHSU in September 1966. His career was not only exceptionally long but also exceptional for the influence he had on his students, colleagues, and his community, according to Mike Yawn, political science professor. 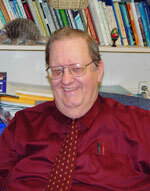 He was awarded the university’s “Excellence in Teaching” award in 1991 and served as the acting chair of the political science department in 2007-2008, before passing away on the last day of classes in the fall of 2008. Outside the classroom, he served as chair of the Walker County Democratic Party from 2006-2008 and was equally active at St. Stephen’s Episcopal Church, where he sang in the choir and served as a lay eucharistic minister. Following Black’s presentation, a ribbon-cutting ceremony will be held to unveil the Holcombe Faculty Room on the fourth floor of the CHSS building. For more information about Black’s presentation or the ribbon cutting, contact Yawn at 936.294.1456 or mike.yawn@shsu.edu.